McKenzie Sparks and Delaney Davenport live in the little town of Cielo Mar on California?s central coast. 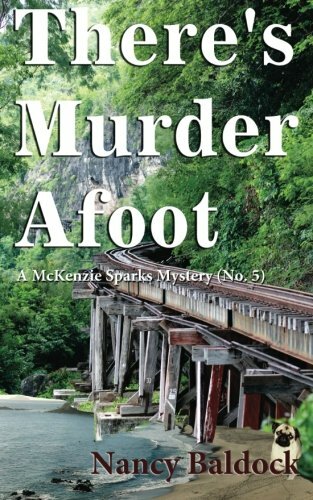 When McKenzie is warned of a murderous animal in the woods, she and Delaney are led to a local tourist attraction and some wicked surprises. With the beautiful surroundings of Cielo Mar as a backdrop, the heroines are propelled into a mystery that involves the Russian Mafia and the real probability of bigfoot. Join them as they find clues that piece together the puzzle of a girl with a missing foot, the henchman of a Russian Mafia boss, two strange men that are seen wherever McKenzie goes, and a ballerina that loses her fiance under bizarre circumstances. Of course, there are a couple of bodies found along the way. There is humor, suspense, and action sprinkled with the charm of Roxie, McKenzie?s pug, and the warm friendship between Delaney and McKenzie. Cielo Mar will never be the same. How could it be when There?s Murder Afoot?